Imagine a movie about eight people, seemingly chosen at random, riding on a cruise ship, heading to an unknown destination. It’s a movie about the interaction between these seeming strangers, and what happens as they near their destination — and it’s absolutely riveting. You’ve heard the phrase “an all-star cast,” and that’s partly true here. 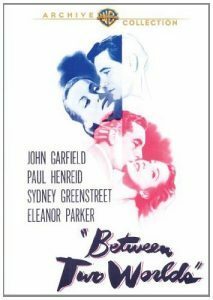 The cast includes John Garfield (The Postman Always Rings Twice), Paul Henreid (Casablanca), Eleanor Parker (The Sound of Music), Edmund Gwenn (The Miracle on 34th Street), George Tobias (Yankee Doodle Dandy), and towards the end of the film, Sidney Greenstreet (Casablanca). These people may not make everyone’s definition of “star” but they clearly know how to act, and demonstrate it here. I won’t spoil the movie, other than to urge you strongly to watch it for yourself. It is frankly a minor masterpiece. Nazi bombs rain fire into an English port town. The smoke clears and a disparate group of human beings caught in the blast finds itself aboard a luxury liner headed … who knows where. They soon learn their one-way tickets are stamped Heaven. And Hell. A dose of World War II realism puts a gritty edge on this retelling of the early Talkie Outward Bound (starring Leslie Howard) that loses none of the prior version’s ethereal power. A stellar cast — John Garfield, Paul Henreid, Sydney Greenstreet, Eleanor Parker, Edmund Gwenn and more names evocative of a remarkable filmmaking era — bring their considerable talents to a tale of passengers who discover their true natures as they discover their destinations. Tom Prior (John Garfield): I read a great epitaph once, I’m gonna steal it for myself. Tom Prior (John Garfield): Here lies Prior, died a bachelor. Wifeless. Childless. Wish his father’d died the same. Reverend William Duke (Dennis King): Why it’s Thompson, Tim Thompson, same as ever! Reverend Tim Thompson (Sidney Greenstreet): Looking like a character that stepped out of the middle ages, eh? Reverend William Duke (Dennis King): Oh yes, Ferguson said that. Reverend Tim Thompson (Sidney Greenstreet): And what did you say? Let him go right back there!